Ricardo Sanchez Colclough (/koʊkˈliː/ kohk-LEE; born September 26, 1983) is a Canadian football cornerback and linebacker in the Canadian Football League who is currently a free agent. 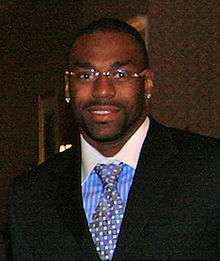 He was drafted by the Pittsburgh Steelers in the second round of the 2004 NFL Draft. He played college football at Tusculum. Colclough has also been a member of the Cleveland Browns, Carolina Panthers, and Kansas City Chiefs. He earned a Super Bowl ring with the Steelers in Super Bowl XL against the Seattle Seahawks. He was drafted with the sixth pick of the second round of the 2004 NFL Draft out of Tusculum College. He is perhaps best known for his momentum-shifting muffed punt in week three of the 2006 season. With the Steelers up 17 to 14 against the Cincinnati Bengals, Colclough was back for a punt with roughly eight minutes remaining. He attempted to field the punt by raising his hands above his head, then dropping the punt. He and teammate free safety Tyrone Carter both had a chance to recover, but both failed. One play after the miscue, Bengals quarterback Carson Palmer hit wide receiver T.J. Houshmandzadeh for a score. The Steelers ended up losing the game, 28-20. Colclough was put on the injured reserve list in early October of the 2006 NFL season. On October 30, 2007, Colclough was released by the Steelers after appearing in three games. The next day he was claimed off waivers by the Cleveland Browns. He played the rest of the season with the team before becoming a free agent. On March 1, 2008, Colclough signed a two-year, $4 million contract with the Carolina Panthers. Colclough was released by the Panthers on August 30, 2008, hours after receiving a DWI. Colclough was signed by the Kansas City Chiefs on November 5, 2008. He was waived on September 29, 2009. Colclough was signed by the Omaha Nighthawks in 2010. He was re-signed by the team on July 15, 2011. On March 12, 2012, Colclough signed with the Edmonton Eskimos of the Canadian Football League. In two games, he recorded 6 tackles. On July 23, 2013, Colclough signed with the Toronto Argonauts. He was released by the Argonauts on May 26, 2014. ↑ Wootson Jr., Cleve R.; Charles Chandler (2008-08-31). "Panthers Colclough receives DUI, is cut". Carolina Panthers. The News & Observer. Retrieved 2008-09-01. ↑ "UFL Transactions". OurSports Central. July 15, 2011. Retrieved July 15, 2011.